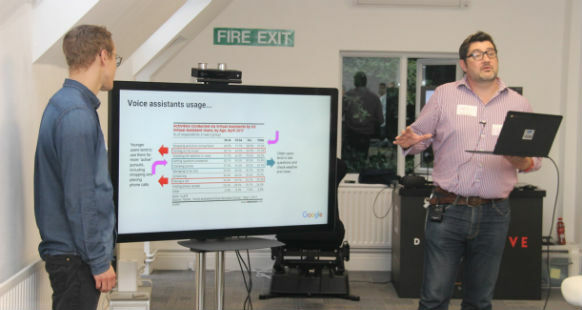 Chris Mantle and James Smith from Google Partners spoke at our office warming party about the future of voice search. They gave us an interesting insight into how voice technology is working now and what developments are going to mean for the way we search in the future. Chris began the talk by asking our guests what autonomous devices they owned and used. The voice control landscape includes smartphones, smart speakers, laptops, cars, robots/toys, appliances, wearables and TVs. Most people had used voice control on their mobile, but the standout autonomous device owned by one of our guests was a robot vacuum. Perhaps in the future this will be the norm! Google revealed some interesting facts and statistics about voice search for the US and UK markets. It’s predicted that 30% of web browsing will be done without a screen by 2020. As voice technology develops further people will become more used to voice searching on a day-to-day basis for various activities, such as shopping. There is already Google Express in the US, which is a shopping service designed to allow you to order products for delivery. Voice search certainly has the potential to make shopping transactions quicker. Well-known brands in the US are already engaging with the possibilities of voice search to increase sales, reach more customers and increase brand awareness. If US companies see the benefits, then it’s reasonable to predict that UK companies will too. It was also revealed that in the future Google expects people to have more conversations with their bots than with their spouse! Voice technology is certainly still in its infancy. If you have used a Google Home device then you will know that it’s not perfect. It certainly cannot answer every question you ask it, but if it doesn’t know the answer then you will hear an apology and the statement, ‘I’m still learning’. Google are investing a lot of time and money into improving Google assistant, allowing it to become far more advanced, in the hope that in the future there won’t be a question Google assistant can’t provide the answer to. One of the most recent developments rolled out with Google’s Pixel update was that you can now ask your Google Assistant a question and then follow it up with another related question and your device will remember your previous questions to provide a better answer. Voice is evolving the way people search and this means that PPC and SEO has to evolve. Spoken search queries are different to typed search queries and this means that changes will happen. For example, the way we currently conduct keyword research will not always be appropriate for voice search queries. For PPC, voice search could lead to the introduction of new, more flexible campaign strategy. Google emphasised that we’re moving from a mobile first to voice search kind of world and asked, is your digital strategy prepared for those changes? The end of Google’s presentation was the moment where we all thought Google would share the next 10 years of voice search development with us, but this was not the case. 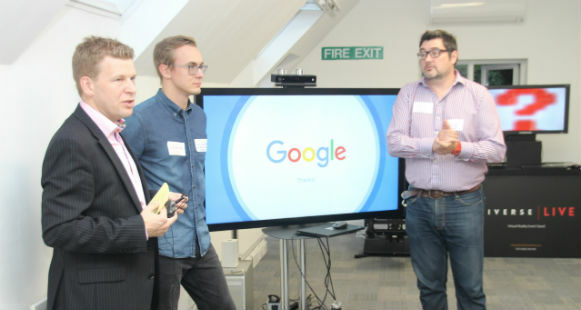 Thank you to Chris and James from Google for coming. Here is the video of their full talk, which you can also view on our YouTube channel.